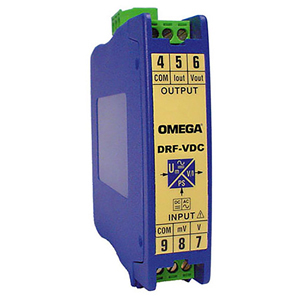 The DRF-VDC and the DRF-VAC voltage signal conditioners accept dc and ac voltages respectively and provide an isolated 0 to 10 Vdc or 4 to 20 mA output. Models are available with three different power options, 24 Vdc, 120 Vac and 240 Vac. The DRF-VDC and DRF-VAC are ideally suited for industrial applications. All models mount on a standard 35mm DIN rail and provide galvanic isolation between input, output and power up to 3500 Veff (model specific). Examples of common model numbers are shown below. See the Part Number Builder to order specific models.